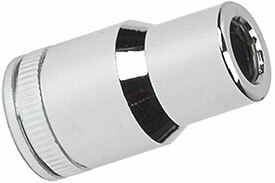 GearWrench 3/8'' drive bit adapter features professional, full polish chrome. The GearWrench 3/8'' drive bit adapter is compatible when you use 80481 5/16'' bit holder socket with 80477, 80478, and 80479 tamper proof torx bit. The 80481 GearWrench 3/8'' Drive Bit Adapter is one of thousands of quality tooling products available from MRO Tools. Please browse GearWrench 3/8'' Drive Bit Adapters for tools similar to the 80481 GearWrench 3/8'' Drive Bit Adapter. 80481 GearWrench 3/8'' Drive Bit Adapter description summary: GearWrench 3/8" drive bit adapter description. Drive End: 0.750'' Nose Diameter: 0.750'' Overall Length: 1.240'' Replacement Bit: Yes Quantity discounts may be available for the 80481 GearWrench 3/8'' Drive Bit Adapter. Please contact MRO Tools for details.